Just don't get stopped for a traffic violation in L.A. as this image illustrates. 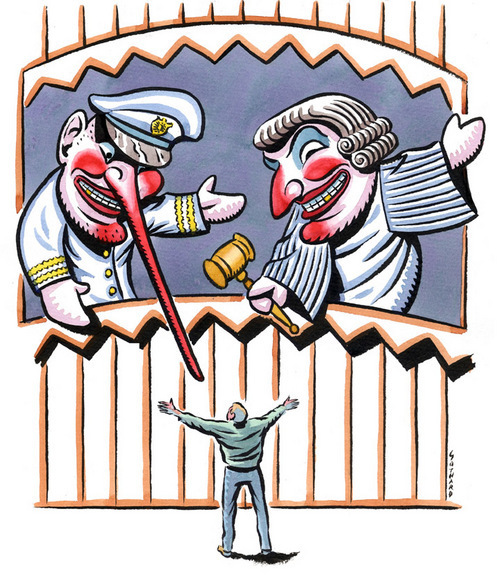 This cover art was for the LATimes on the kangaroo courts, where never a ticket is overturned, police lie and judges rubber stamp. I'm adding puppets to my list of favorite things to draw. Feel free to list YOUR faves. I love this. The reddish color on Puch and Judy is superb. A beauty....for our friend Tom Trapnell no doubt. Ditto on the red, Dave! The color on this piece really comes to life. I like how you've left so much white and not painted everything in. And the puppets are fun! Love it! That long thin scary nose, and murderous glee in the judge's eye...the beseeching figure! Your work is so full of emotion and beauty. David, I'm glad you said dragons! I've been poring over your beautiful artwork in your galleries and was really struck by the dragons- it's obvious that you take pleasure from doing them: there's something about their shapes that is almost the embodiment of your style: characterful, dynamic, fluid and playful with a hint of menace. I absolutely love the lying cop (well at least in this excellent drawing). You should do a drawing of a dragon skeleton with a bunch of puppies in it's belly, finally being abel to escape to stuffed freedom. I'm sure you would knock our socks of. my favourite things to draw: faces, people, weird animals. Looks like that chappie is about to be skewered Dave! thanks for Sharing. David, nice, the bars of the stage work in well. I like drawing pyramids, a bomb blasts and tentacles.